In Canada, one prepares for the onslaught of vehicular traffic.... perhaps adjusting their helmet or maybe the body armor. You folks are always coming up with an original and interesting theme for the ordinary. It's worth checking out every day. 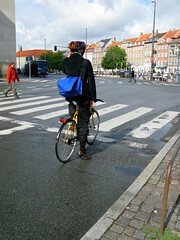 Why don't the Danes ever say "hi" to each other at the traffic lights? 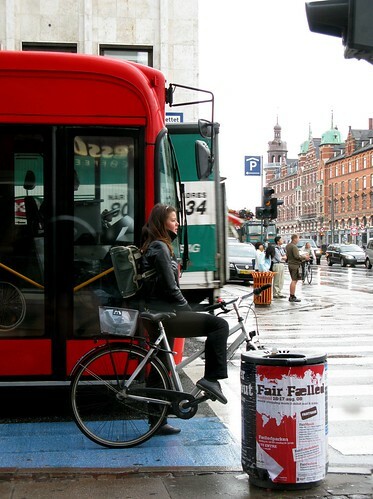 There never seems to be any kind of vocal communication between strangers in Denmark unless there has to be. Why is that? Love this site!! 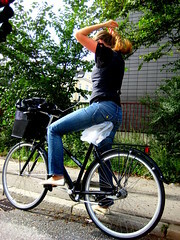 Does anyone know what kind of bike the 'adjust ponytail lady' is riding - I want one! lfaber, depends where you are (and I won't get into Québec vs Canada constitutional issues on this blog) - here in Montréal, while the helmeted lycra-lout type does exist, there are countless examples of cyclists, women and men, young, old and in-between, every bit as chic as the Copenhagen residents Mikael features, or the Amsterdamers on Amsterdamize. That because, after decades of pressure by cyclists - yes, including chic cyclists - there is a real (if far from complete) effort to eliminate hazards at the source, making body armour superfluous. 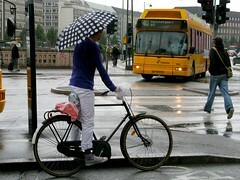 will you have the pleasure to give a bike in your blog anniversary??? al: i don't get the question. do you say to everybody you pass when walking down the street? do you honk and wave at other motorists at the red light? Danes, like the other Scandinavians, are reserved. It's a cultural thing. nothing wrong with cultural differences.